Duluth, Minnesota-based Cirrus Aircraft chose Sun ’n’ Fun 2016 as the spot to debut its final production interior for the soon-to-be certified Cirrus Vision Jet, which is powered by a single Williams International FJ33-5A jet engine, producing 1,800 pounds of thrust. According to Ben Kowalski, Cirrus v-p of marketing for the jet program, the company holds close to 600 orders for the nearly $2 million jet. He told AIN that he expects type certification by the end of the second quarter, with production ramping up quickly thereafter. The company goal is to produce 125 Vision Jets a year, though Kowalski was quick to note that would not be the production rate in the beginning. “The interior we’ve brought to the show is very close to what you’ll see in the production aircraft, with just a few minor modifications to be made,” explained Kowalski. 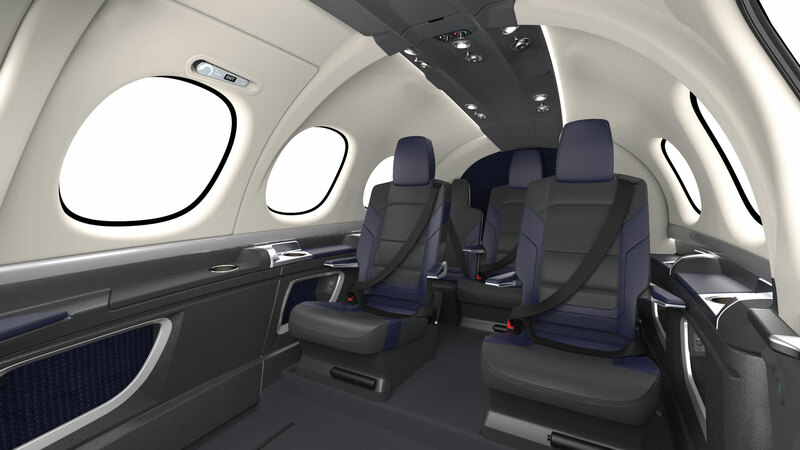 The aircraft cabin configurations are extremely flexible, with modular all-leather seating that can be arranged for four, five or even six passengers, plus the pilot. A distinctive feature of the aircraft is that the pilot’s seat slides backward several feet, allowing for easy entry and exit through the aircraft’s clamshell door. It also allows the pilot to open and close the cabin door while seated. The seatbacks taper to narrow headrests, designed to enhance the sense of space in the cabin. Despite the narrowness of the seats at the top, there is plenty of shoulder room and even a clear path for rear-seat passengers to transit for entry and exit. It is not a stand-up cabin, but it is comfortable. And the cabin is spacious. “The pressure vessel for the Vision Jet is one piece of carbon fiber, and [it is] extraordinarily strong,” said Kowalski. Because of its construction and bulbous shape, the passenger windows are relatively large for a pressurized light aircraft, giving those in the back of the airplane an expansive view. The light gray leather and distinctive stitching adds to the effect. Cirrus is known for having a high-end automotive-style finish to its interiors, with plenty of passenger conveniences. The jet follows that mold, with built-in cup holders in the arm rests, plenty of USB power outlets, a drop-down overhead screen for entertainment, and more. The first phase of the Center is expected to open this summer, and by fall, all Cirrus deliveries will take place there. The Center will be part FBO, part delivery depot and dedicated MRO shop for the company, and also the headquarters for its Cirrus Approach training program. “CAE is building us Level-D full-motion flight simulators, and we’ll be doing all the type training for Vision Jet pilots. Our flight training staff are, as we speak, procuring their LOAs in the aircraft, and we’ll be ready,” said Kowalski.